Does the Range Rover Evoque convertible fail to meet your needs? Would it be the weird niche vehicle for you, if it was just a bit bigger and a bit posher? Then step right this way, as we have a car you’re bound to be interested in. 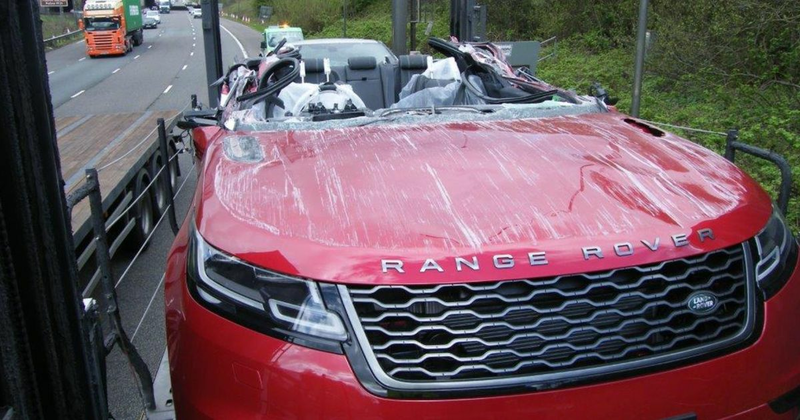 It’s the world’s first Range Rover Velar convertible, created by an intrepid transporter lorry driver who forgot to lower the top deck of his vehicle before driving on the M61 motorway in the north west of England. This unconventional approach to vehicle customisation (smashing the top end of an expensive, brand-new car into a bridge) has resulted in quite a bit of glass and general debris littering the cabin, so the owner will need to do some pretty intensive vacuum cleaning. But that’s surely a price worth paying for this level of style. Unfortunately, North West Motorway Police didn’t take too kindly to this vehicular creativity, reporting the driver for driving without due care and attention.